Miss Peaches, the social media alias for Austrian-born Nina Gutenhaler, is a downhill cycling enthusiast and closely watched character throughout the Instagram and Facebook sphere. We simply love what she does and how she does it, so we baked a little deal and sent her on an adventure. Nina’s road trip is every social media influencer’s dream come true – with the support of ŠKODA AUTO, she set out on a journey covering 8 different spots across Europe, meeting with 8 sports professionals along the way. In the first episode, we’ll get to know a very talented young woman, defying gravity on her bike. Have you ever heard of a discipline called artistic cycling? Well, now you have! Nina got together with Viola Brand, an insanely skilled champion athlete from Germany, to watch her perform and to learn a trick or two. But after trying out some of Viola’s “basic” tricks, Nina is glad to keep close to the ground by sticking to downhill! Learn more about Viola below. In the next episode, Miss Peaches will get a little taste of aerial freedom – with paragliding! 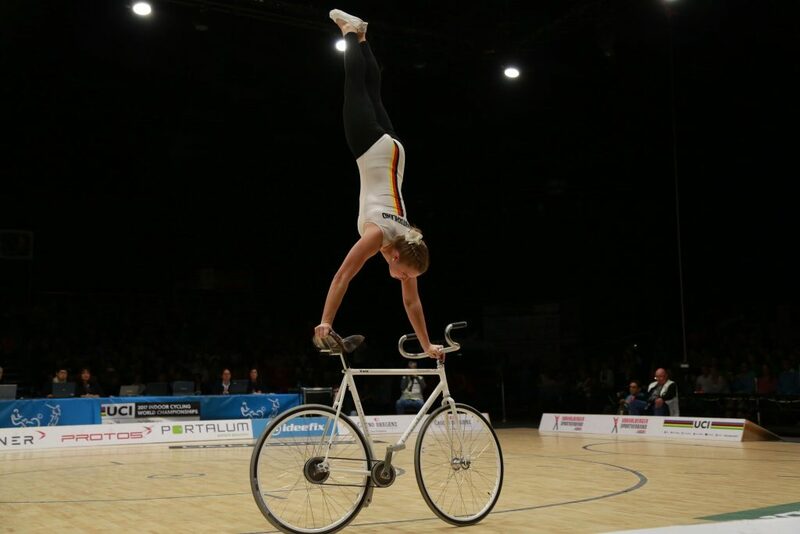 Professionally-wise, artistic cycling (often called freestyle cycling) is a niche sport within the UCI, merging elements of cycling with those of gymnastics and even dancing. Much like these disciplines, while competing, the athletes perform a 5-minute routine in front of a jury and are ranked using a marking system. So, while most of us enjoy our bikes with both wheels planted firmly on the ground (except for the occasional trail jump and light road bunny hops), these athletes love to spin around on their bikes not unlike the Russian Ballet ensemble and will make your head turn in awe. So, what is it exactly? A mixture of gymnastics, cycling, balance, art, strength, and dancing? The best way to find out is to chat up a professional athlete, such as Ms Viola Brand from Germany, a multiple World Championship medalist in this sports field. So, that’s exactly what we did. Viola, we have just a generic description of what artistic cycling is. In your own words, how would you describe the sport? That’s not an easy question! But I think that your description is already really good! 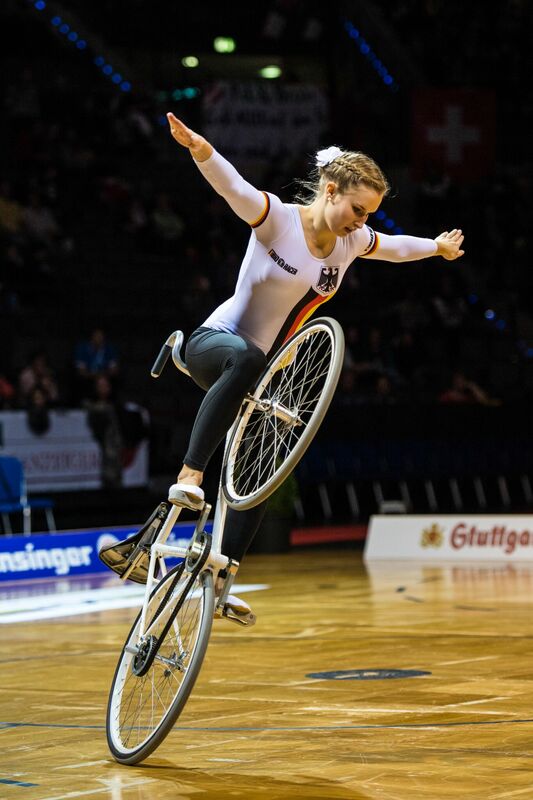 Definitely, it is something between gymnastics, cycling, balance, art, and dancing. Some people even like to call it “bike-ballet” and I think it’s an awesome expression. Artistic cycling seems to be a sport requiring many different physical qualities such as trained strength, a sense of balance, flexibility etc. In your opinion, what are the most important ones? To be honest, I think it’s patience. Of course, you need all these physical qualities but even if you have them, you need a lot of patience and discipline because, for some of the figures we are asked to perform, you need many years of practice to master them. For example, it took me 7 years of training in order to learn the handlebar handstand. So, you need to keep up with the daily training even if you don’t see any progress for months at a time. In the last few years, we have seen freestyle cycling benefit greatly from Social Media exposure and, therefore, grow in popularity. Even if the sport as been around for well over a hundred years, it is only recently that many people are exposed to it thanks to various online platforms. In this context, you are what we’d call a leading persona in bringing artistic cycling “to the streets”. How did this happened for you? Was this something you decided early on in your career or is it something you discovered only recently? For me, it all started when a friend of mine told me that I should create an Instagram account in March 2017. So I did! But of course, I never expected that I would reach over 100k followers. This was really unexpected to be honest! Within the first few weeks of creating my account, some pages shared my videos and this gave me a lot of new followers. It’s awesome that I can reach so many people through social media and I see it as a huge chance to make this sport better known all over the world. Was it a marketing choice or a professional one to get involved in social media this much? Well, you see, as my account got bigger I started to buy some gadgets for filming or to take better photos in order to be able to upload higher quality content. So, it was neither a marketing nor a professional choice, it was just an advice from a good friend and I am really thankful for that! Lets go back in time to when you started with artistic cycling. How did you get into the sport and why? Do you have a gymnastics or ballet background? I never did ballet or gymnastics before. In fact, it was my older brother who started first! But at the age of 6, I started training with him and my mom very often. My mom is the coach for the two of us, by the way. So from the start, I saw that this sport was really amazing and really different from those other children were doing at the time. Please, can you give us a run-down of your weekly training routine? Everyday, I am either at the university or studying at home. I do a lot of handstands on the ground. By the way, in order to master a handstand on the bike, you need to be able to do the handstand on the ground easily and with a good technique. So the training is about strength and technique and getting used to many handstands because then it’s easier to do on the bike. This is just a taste of my daily routine. In the evenings, I go to the gym hall to train on the bicycle for 3 hours. This is my daily routine from Monday to Thursday. Over the weekend, I either go to training camps or competitions. On Fridays and Saturdays, I usually train at home. On Sundays, I take the day off if it’s not a competition day. It is well known that professional athletes will combine other physical activities in order to improve their body strength, flexibility, etc. For example, professional road cyclists will often add swimming to their routine. Are you combining other sport(s) with your training? I do flexibility and strength training. Also running but I don’t do any other specific sports discipline in full. We know that you currently study at a university. What do you study and what would you like to do in the future? I study nutritional management and dietetics. This summer, I will get my Bachelor of Science degree and I hope that I can do the Master’s in the following years as well. You are de-facto a role model for younger girls. What should they do if they want to succeed in the sport of artistic cycling? Should they start with a different sport first? If they want to succeed in artistic cycling, then they should have a lot of patience and discipline to train almost everyday. Sometimes, to firstly become a gymnast may be a good plus. But myself, I did not do other sports before so it really depends. More importantly, it’s important to start at a young age. But I think it’s also the mindset of what they want to achieve or not. 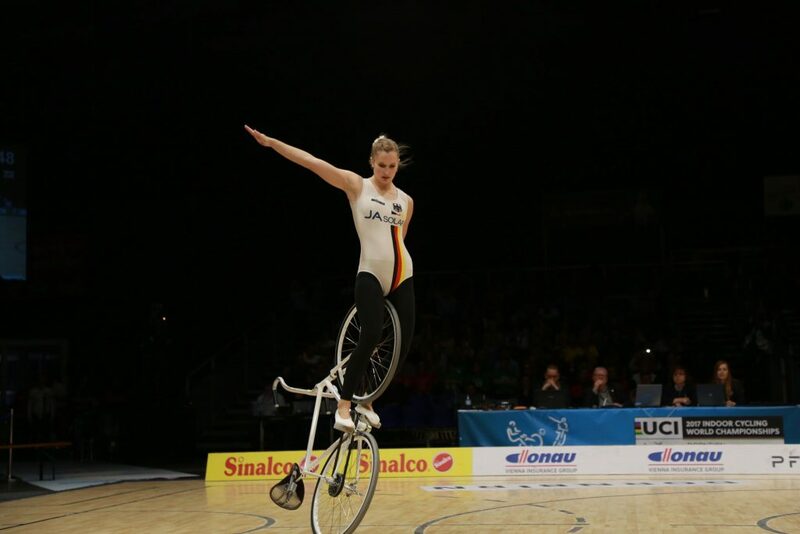 The Cirque du Soleil is well known for their use of athletes in their world shows, and “Kurio” is a well-known example for its use of artistic cyclists. Is this something you would like to pursue following your professional career? Yes, why not. But of course, it would be only possible after I have finished my competition career. I would be more than happy to have the chance to work with the Cirque du Soleil. Lastly, we have some multiple choice questions for you! Let’s call them “Viola’s Top Picks”. For each of these, we ask you to select one and only one option. Viola’s Top Pick #1: You are currently a student at a university. Are you commuting by: a bike, public transportation, or a car? Well, since the distance from my home to the university campus and then to my gymnastic hall is about 100 km (which I must commute everyday), it would be too much to use a bike! Also, as public transportation isn’t as good as I wished it to be for commuting, I must rely on a car, unfortunately. But of course if possible, it would be best to use a bike! Viola’s Top Pick #2: You are forced to chose a different discipline to compete in. Which one would you chose: gymnastics, karate, road cycling or basketball? Viola’s Top Pick #3: You are asked to work on promoting a cause / charity event. Which topic would you chose? Amateur sports in schools, women rights advocacy, cancer research or healthy school lunches for kids? I would go for Healthy school lunches for kids. Viola’s Top Pick #4: For your casual weekend bike ride, which combo would you chose? A road bike and Lycra, a cruiser bike and casual shorts and a t-shirt or a city bike and an “Amsterdam chic Vélo” style clothing? For sure I’d go for the chic Vélo style!